Craving wontons? 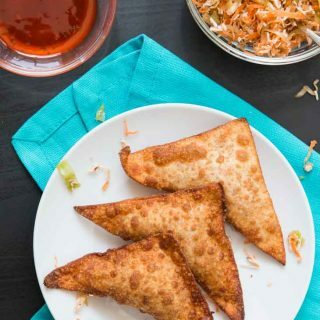 You don’t need to run to your closest restaurant to enjoy these crispy bites. Learn how to make wontons yourself in this easy 4 step tutorial! 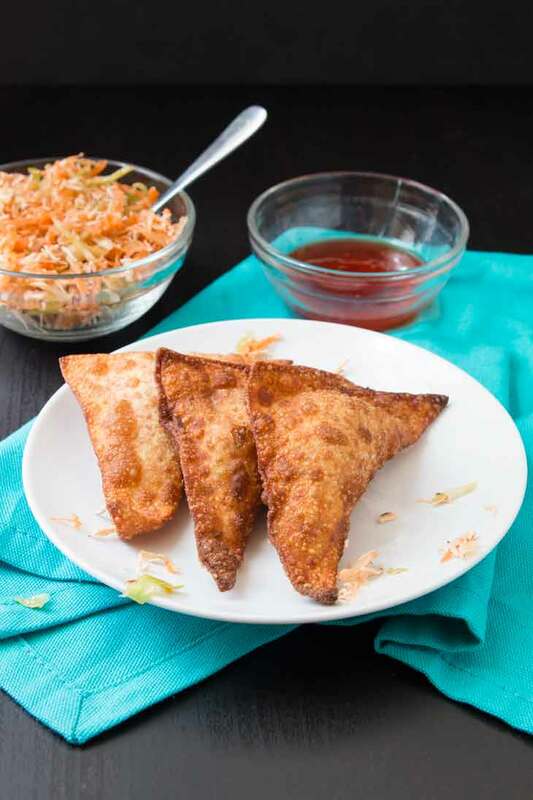 These tofu & vegetable crispy wontons make for the perfect snack, appetizer, or lunch. And once you start dipping, you won’t be able to stop enjoying them! Out of all the different flavors out there, some of my favorites are the Asian cuisines. I realize that’s a pretty broad category, but specifically, I’m talking about Thai, Japanese, Chinese, Vietnamese, & Korean foods. There’s Pho, various noodles, soups, stir-fry, sushi, spring rolls, the sauces, etc. And even though they can have very different tastes, I love it all. I can’t claim to be an expert in any one of these cuisines, nor can I say, for certain, that I’ve had truly authentic versions of their dishes. 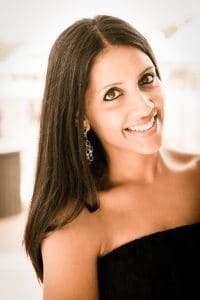 Most if of my experience is based on Americanized-versions at restaurants, my mom’s home cooking, and flavors that I’ve attempted to re-create in my kitchen. This recipe is yet another favorite Asian-inspired favorite made simple at home. Wontons! Crispy veggie & tofu filled wontons. I mean come on…what kid (or adult for that matter), doesn’t enjoy a delicious filling wrapped up and fried? Not to mention that dipping sauce!! You’re in luck, because I’m going to show you how to make wontons in just 4 simple steps! Wontons are dumplings found in many Chinese cuisines. Similar the potstickers & gyoza, they fall under the general category of dumplings (dough that encloses some sort of filling). The main difference between these three and other types is the country of origin, shape, thickness of the dough, and cooking method. Wontons traditionally consist of a thin square wrapper enclosed with a filling and and formed into various shapes. They can be boiled, steamed, added into soups, and even fried. Most people seem to be turned off by making vegetable wontons at home when they see all the steps required with making the filling, folding, and sealing wonton wrappers, unsure of how difficult or time consuming it would be. So let’s focus on these steps above so I can show you just how easy these are to make!! Filling.There’s such a huge variety when it comes to making a filling, but I like to keep it simple and tasty with a mix of finely shredded carrots, cabbage, and baked tofu, seasoned with some salt and a tiny amount of soy sauce. 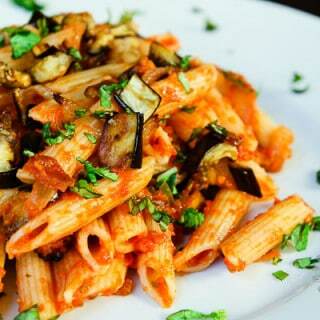 It’s nothing fancy, but still super delicious, healthy, and most importantly…easy! Wonton Wrappers. Traditional wonton wrappers are made with flour, eggs, water, and salt. 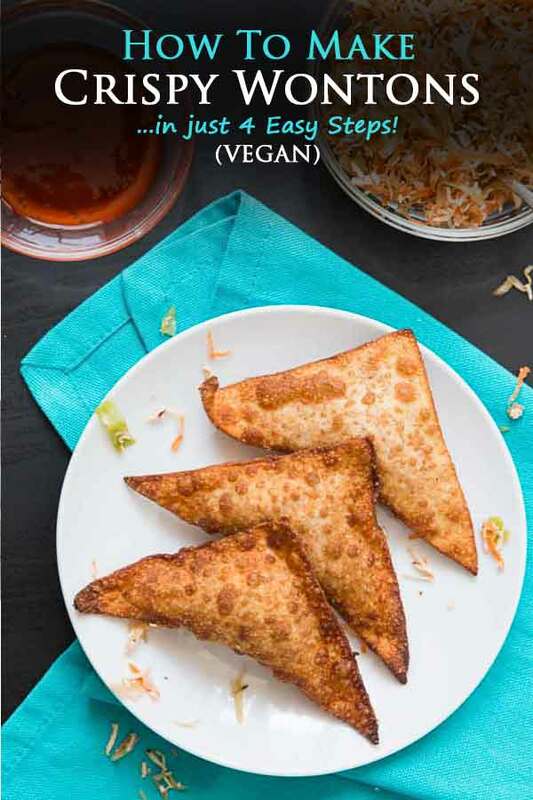 And although there are tons of recipes out there where you can make your own vegan wonton wrappers, I’m going to be honest here and say you won’t see me jumping up and down to take on that task. Especially when there are vegan eggless wonton wrappers you can find at stores. The brand I typically use and find at Asian grocery stores is Twin Dragons, but you can also find the eggless ones by Dynasty at most major grocery stores. Unfortunately neither of these are gluten-free. I’ve tried using a few different rice paper wraps, but they tend to retain a lot of oil. If you’re looking for some gluten-free wonton wrappers, my friend Natalie has this easy 4-ingredient recipe that you should definitely try out! Folding. Ok, before you stop reading, let me just tell you that my kids helped me fold these one afternoon. It’s really that easy. Place a square wrapper in the palm of your hands, place some filling in the center, and take two corners together with the other hand to seal the edges! No fancy shapes…just straight triangles! Sealing. Oh… did I mention I use my finger tips and some water to seal the wontons shut? Yep…it’s that easy. Cooking. My families personal preference when it comes to wontons is always crispy. You know how I’ve said I rarely fry things? Well this is one of those rare occasions where we love fried crispy wontons! Alternatively you can bake them in the oven for a healthier (yet still crispy) option. And lastly, what’s a crispy wonton without a great dipping sauce to go along with it? I’ve linked to a few of my favorite dipping sauces in the recipe below, some homemade and others store-bought for a quicker option. This fried wonton recipe comes from my Mom. Growing up, we enjoyed going out for Chinese food, and one of our favorite appetizers to order were crispy wontons. So naturally, as she did with many other ethnic cuisines we tried, she re-created her own perfect version. I had completely forgotten about them until recently when I realized that my kids love that wonton-crispy roll type appetizer at restaurants just as much as we did when we were kids. They had a great time helping me assemble the wontons! Get creative with the filling, or start of easy and simple with my tutorial on how to make wontons & recipe below! And if you’re anything like us, then be sure to make extra because they tend to disappear as soon as they’re served! 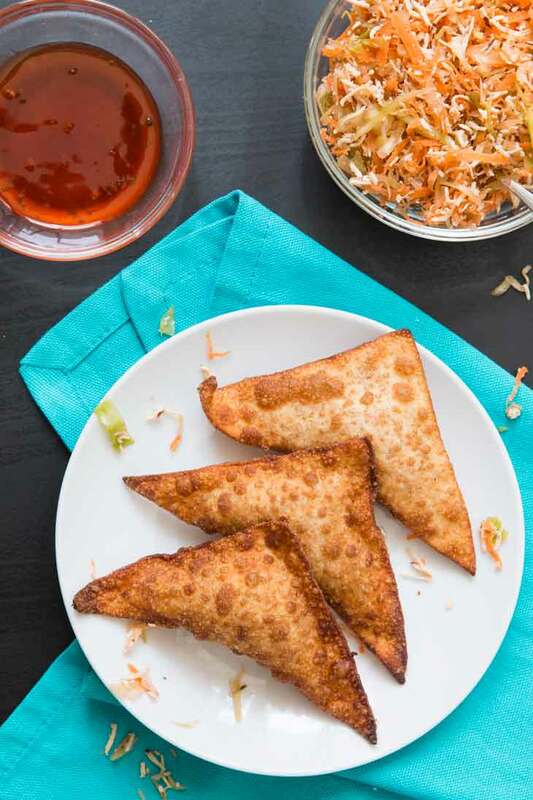 These tofu & vegetable crispy wontons make for the perfect snack, appetizer, or lunch! And once you start dipping, you won't be able to stop enjoying them. Shred the cabbage first with the fine blade using a Mandolin Slicer (as fine as you can shred), a food processor, or fine grater. In order to get as much water out of the cabbage as you can, add about 1/2 teaspoon of salt to the shredded cabbage. Mix and set aside while you continue with the rest of the filling ingredients. Shred the carrots and baked tofu using the same method as above. Dry the shredded cabbage with some paper towels as best as you can. Mix the cabbage, carrots, and baked tofu together in a bowl. Add salt and soy sauce to taste and combine well (make sure the mixture is not too wet). 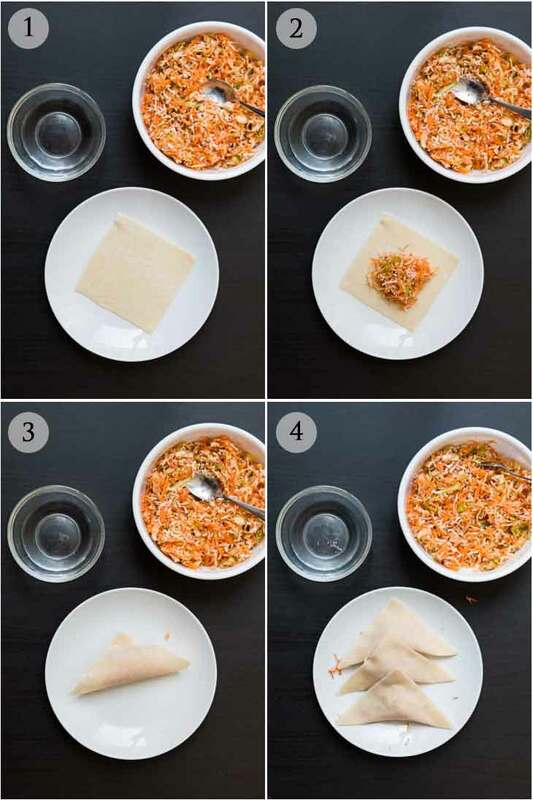 Place one square wonton wrapper flat on a clean surface or on the palm of your hands, whichever you prefer for filling. Place a small amount of filling in the center of the wrapper being careful to keep the filling contained in the center only (amount depends on size of the wrapper). After making one, you will get a feeling on how much filling you can put in each wrapper. Dip your finger in some water. Run your finger along all four sides of the wrapper to moisten, and fold into a triangle. Pick up the triangle by the top corner and press along both sides to seal. Water is the adhesive to close each wonton. It is important to make sure it is completely sealed. Repeat to fill additional wontons until all of the mix is used or make a few batches at a time and fry/bake in between. Alternatively, make as many as you want, and store the rest of the filling in the fridge to use the following day for leftovers. Heat some avocado oil in a shallow frying pot on medium heat. Slowly place the wontons in the hot oil and fry until the wontons are golden brown on each side. The amount of wontons you can fry at once depends on the size of the pot you have. As they are frying, you can continue to fill more wontons, but be careful not to over-fry since they will cook quickly. Once they are done frying, place the fried wontons on a plate lined with a few paper towels to absorb any residual oil. Preheat oven to 400 degrees. Line a baking tray with parchment paper. Lightly spray the assembled wontons on both sides with spray oil (I use avocado spray oil). Bake for about 5-10 minutes or until wontons are crispy and golden. These are best eaten HOT with your favorite dipping sauce. I use a combination of sweet & sour sauce and chili sauce for some added spice, or peanut sauce. Wonton Wrappers - My favorite brand to use is Twin Dragon Wonton Wrappers which you should be able to find at most asian markets. Otherwise I've also used Dynasty brand which you can find at most major grocery stores such as Ralphs. Just be sure to check the ingredients to make sure that they are vegan and don't contain eggs. Filling - Feel free to experiment with any other filling, just be sure to keep the moisture and liquid in the filling to a minimum. 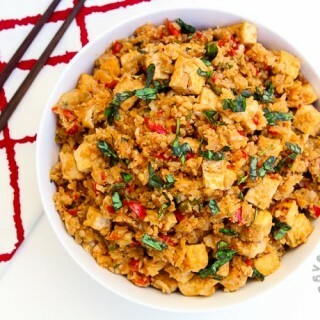 Tofu - It's best to use a baked tofu for this recipe to reduce the amount of liquid in the filling and due to the texture of the tofu. Any flavor you find should work, but I typically get plain or savory baked tofu. For a step-by-step visual on how I prefer to wrap these wontons, see my post above. Dipping Sauces - Use any dipping sauce you prefer. Some simple teriyaki sauce, chili sauce, a combination of sweet & sour, plum sauce, peanut sauce, etc. Make Ahead Tips - Prepare the filling one day in advance and simply assemble the wontons and fry/bake when you're ready to serve. Nutritional Information - May vary depending on filling amount. Does not include any oil for frying or baking. Yes! 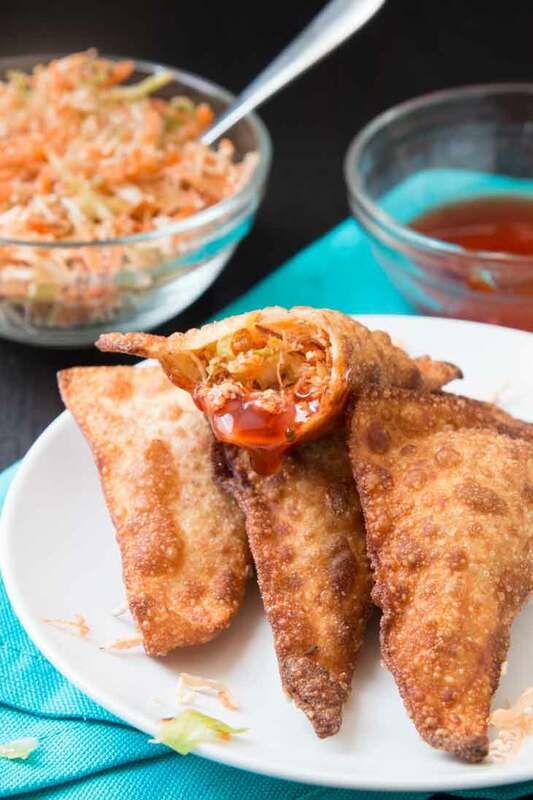 Grab some wonton wrappers and try out this recipe. You can really fill them with anything...so delicious and a great lunch option! Thanks so much! Anything crispy and i'm there ha! These look like crispy little parcels of deliousness. I have to agree, I really do enjoy Asian food and these look incredible. Thank you!! Hope you get a chance to try them out sometime soon!